Mehrens, who also represented Dan Lovelace, the Chandler cop acquitted of the October 12, 2002 murder of 35-year-old Dawn Rae Nelson, said he has not been offered a plea bargain from the state, nor has he asked for one. “[Your] story was bizarre to us because in most criminal cases the plea is offered immediately,” Mehrens said. “Your source is not reliable.” The trial for Chrisman has now been continued a total of nine times by the defense and prosecutor Juan Martinez, who seems to be too busy signing autographs for the Jodi Arias case. We went on to discuss the prosecution’s key witness, Officer Sergio Virgillo, and how his testimony will play a part at trial. Virgillo, the officer who witnessed the shooting, said he was standing right next to Chrisman when he and Mr. Rodriguez were “grabbing each other.” Virgillo said he “looked away” after Chrisman pulled his gun out and fired seconds later, according to the police report. Virgillo stated that neither he nor Chrisman were ever in any danger that would require the use of lethal force. Mehrens called Virgillo’s testimony “a fairy tale” in the above CNN interview a few weeks after the murder. “Virgillo’s story is inconsistent with the physical evidence in this case,” Mehrens said. “Its not my client’s word against [Virgillo’s]; it’s Officer Virgillo’s word versus the physical evidence. It simply doesn’t fit,” he said. “Maybe Virgillo is just mistaken in his story. He dropped his Taser and notebook outside the trailer, so obviously he was outside the trailer while my client was inside doing his job,” Mehrens said. 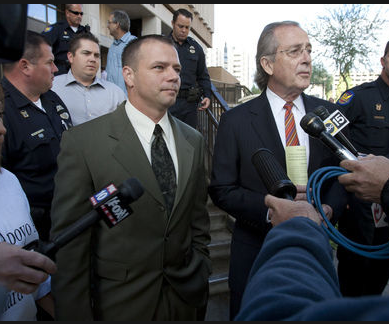 The parallels between the Chrisman case and that of Lovelace 12 years ago were also discussed. Lovelace had serious character issues, including being involved in a 2000 high-speed chase of an alleged stolen truck. The reckless pursuit, at speeds of over 100 mph on residential streets, resulted in the March 13, 2000 death of University of Arizona freshman Bradley Downing III. Two years later, Lovelace killed Nelson. The death of Mr. Downing, which the city of Chandler ultimately paid millions of dollars for in a civil suit, was apparently not enough to convict Lovelace; nor was the fact several people who witnessed the shooting of Ms. Nelson said she was driving away from Lovelace, thus not a threat. The defense team told the jury that Nelson was an “unfit mother” and had been involved in “felonious activities” that night and at other times in her life. “I don’t think that was an important point in the case at all,” Mehrens said. “The jury acquitted Dan Lovelace because they felt [Ms. Nelson] was driving to escape when she was not supposed to be [leaving] the scene, and put [Lovelace] in a position that he thought he was going to be killed. I bet if you interviewed the jurors, they would say the character issues of Dawn Rae Nelson had nothing to do with the acquittal,” Mehrens said. Two of the jurors in the Lovelace case later befriended the defendant and testified on Lovelace’s behalf when he was trying to get his job back after being acquitted, according to the Arizona Republic. The history of Chrisman will not win any Mother Theresa awards either. One well-documented incident occurred in 2005, when Chrisman planted drugs on a mentally-ill homeless woman. Chrisman described the incident as “a prank,” but was suspended for one day by the Phoenix Police Department as a result. He is also on the Brady List; a database for police officers with questionable integrity, according to Fox 10 and the Phoenix New Times. Several bloggers have written of previous brutality complaints against Chrisman as well. Mehrens does not believe these incidents will play a factor in the instant litigation. “Any murder case is an incredibly difficult case to defend. Everyone’s different and everyone’s difficult,” Mehrens said. *(UPDATE) Mr. Mehrens contacted us and said Virgillo was not the arresting officer. After reviewing the police report, this information has been updated, along with Chrisman being on the Brady List for Maricopa County.